How To Do A Manual Penalty Recovery That Works! Manual Actions are a specific type of penalty applied to websites by Google analysts that manually assess your website and check if it meets Google Webmaster Guidelines. The current case study looks at a Manual Action caused by Unnatural Inbound links pointing at the website. 1 How Do You Know if You Have A Manual Action? 3 What Can Cause a Google Penalty? 6 The Disavow Tool: Does it Work? 8 How Do I Know If I Got Hit By A Google Manual Action Penalty? How Do You Know if You Have A Manual Action? The easiest way to tell if you have a Manual Action on your website is to check you Google Search Console (previously known as Google Webmaster Tools) and under Search Traffic look at the information in the Manual Actions section. The penalty can be site-wide, which means that it affects the visibility of the entire website in Google results, leading to massive drops of over 80% of organic visits. Or, it can be a partial match, in this case the loss of organic traffic can be up to 40% as a rule. What Can Cause a Google Penalty? One of the most obvious causes for Manual Action Penalties—which require Google penalty assessment and reconsideration request services from expert SEO consultants—is trusting the wrong people with your SEO. While it’s not the safest bet to invest all your budget in SEO and ignore other aspects of online visibility, it’s also very important not to cut corners with SEO. When you choose SEO companies based on out of the box approaches that guarantee a set number of backlinks per month or claim they will get you to 1st position in Google for your highly competitive keywords, and even better, get you there in an exact amount of time, you should quickly end the call, cut the meeting short, exit the website or trash the email. “Black Hat” SEO companies prey on small business owners by luring them the promise of amazing results. But, they employ unethical SEO tactics (that are against Google’s rules) to get them there. While short term results might be amazing, catastrophic results are soon to follow. I Can do This On My Own, I Read Forums! Here’s another scenario when Manual Actions Penalties can upend your world as a website owner: You have started your own business, read a few forums with flashy banners promising to get you to the top for as little as… insert generic low price here … and you’ve decided you should just cut a few corners and wing it, after all, SEO is not THAT hard… until those backlink packages you bought come back to haunt you—to the tune of a massive organic visits drop of up to 70%. There are also unfortunate situations where neither you nor a shabby company you hired have tried to rig the system—when your competitors go over to the dark side, and start spamming your website with low quality backlinks. This is true story of how hard negative SEO can hit, and with devastating results if proper action is not taken. 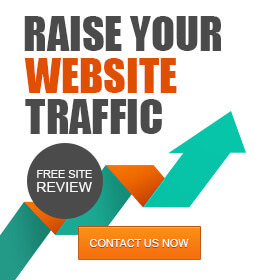 Since the client came to us early on in the project and trusted our SEO expert assessments and followed all our recommendations we were familiar with what had already been done for the site. So, the initial site assessment part was already underway. We love it when clients trust our SEO experts’ opinions. It give us a chance to get our hands dirty, to strategize, make all the little tweaks and adjustments that can make or break a web business by bringing in that extra traffic. Our main focus was always to make sure the on-page SEO was perfect. Since we spent a lot of time working on this project, once things started to go awry we went into site assessment mode immediately. We wanted to make sure our tactics were still in the realms of ethical SEO. But, also to make sure we stayed ahead of the game to catch problems before they get out of control. From the inbound link angle we decided to take a proactive approach. By proactive I mean we had a scheduled monthly backlink analysis using data from 3 sources (almost journalistic in our efforts, wouldn’t you say?). From this strategy we ended up with a disavow file that would put any automatic link detox tool to shame. We could also be sure that since the project had been in our hands no low quality links had been built. Link acquisition had been natural, except for that one time, the time we saw the peak. What peak you say? THAT PEAK:. Once the link spike happened we knew it was very important to do some damage repair and take proactive measures. It was clearly a case of suspicious inbound links. In full action mode, we decided to start pruning our link profile as soon as possible. We made sure points A – E above were respected, and hoped for the best. Why hope for the best, you may ask, when we were applying a successful formula? It’s not because we didn’t trust our process. It’s because there is a clear distinction between an algorithm hit and a manual action. Also because there is huge controversy over whether or not negative SEO (competitors purposely sabotaging your site’s link profile) exists and if google knows how to spot it in time. There is also the problem that if the file is automatically parsed, no SEO specialist can really know whether the disavow tool works. So we saw the backlink profile peak and were fearful of the fallout once we hit the valley. But we also knew that we just couldn’t stand by and watch our client’s site be attacked like this by competitors. What makes a backlink bad? How can you tell which links you need to disavow? How can you tell which links might cause trouble? A more in-depth article on how to correctly analyze a link profile and determine whether manual or automatic revision of backlinks will follow soon. Right now I will just highlight the key aspects to give you a clear picture of what a link assessment process should include when dealing with negative SEO. Keep in mind, these are just the most obvious culprits. There is a lot more finesse to performing link profile assessments that we will get into in the next article. But keep these points in mind so you know what to look for if you suspect toxic links. What we did next for our client is we performed a manual revision of all newly acquired links and made a healthy update to the disavow file which we promptly updated in mid-October. The Disavow Tool: Does it Work? This is another sensitive subject and one of the main questions link builders and recovery specialists alike often pose: How soon after uploading is a disavow file processed and is the disavow file processed automatically or manually? There is reasonable data that suggests, at least in the case of this client, that the disavow file we uploaded in mid-October had’nt yet been processed on December 24th, when the dreaded event took place—the site-wide manual action for suspicious inbound links pointing at the website. This is speculative at best. We will probably never know what triggered the manual review—if the link spike in question was the culprit or if other domains that pointed links to our website since mid-October 2014 had caused the event. Either way, it’s safe to say this disavow file was not processed in the the 2 months after we uploaded it. Disclaimer: Based on other projects where we do frequent backlink profile analyses, we can say that the data suggests that the disavow tool works. But we have not been able to determine when or how it is processed by Google. There are many people out there who wonder: What is the difference between a manual action and an algorithm hit? That is something we’re going to be covering in an upcoming article. But what I want to point out now is that when you get a manual action—you’ll know. There are pretty clear symptoms that allow us to determine the cause. The first sign you have been affected by a manual action is not what you might assume. You won’t get a notification from Google and unfortunately you won’t see it in the nice little tab I mentioned at the beginning of this article. No, you can’t rely on getting the email because by that time, it might be too late. How late you may ask? THIS late. As you can see in the graph, the sudden drop in organic traffic started on the 24th of December 2014. This image is also an interesting showcase of what a Manual Action looks like in terms of symptoms. Tip: This is why I like to start my day with a nice cup of coffee and a review of organic traffic from the previous day. It is vital that you monitor the data from continuous search engine ranking in conjunction with your Analytics report. The problem is that the notification in the search console and the email didn’t come until the 6th of January, 2015. That is a lot of time to spend wondering where your organic traffic went and if it is coming back. 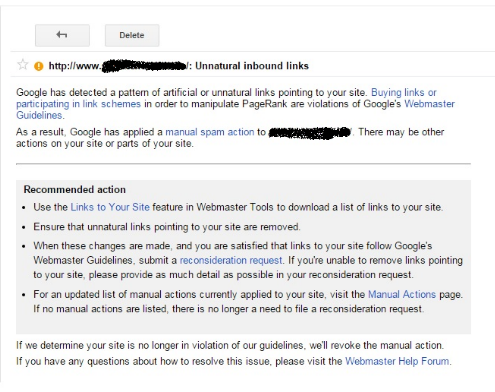 How Do I Know If I Got Hit By A Google Manual Action Penalty? Hint: if you are not ranking for your domain or brand name, you may have been slapped with a Manual Action! A drastic drop in organic traffic from one day to the next. What we did and we strongly encourage you to do also (before yelling fire!) is to make sure that there is no code error that might have caused your Analytics code to disappear from your website. Rule out that possibility first. Since you are already reading the source code of your page, you might want to do a quick search for any robot meta tags that might prevent indexing. We had a situation like this recently. There was no human error, though that was our first suspicion. (With SEO, always try to ask yourself these questions before jumping to conclusions. In our case it was an out of date WordPress plugin that caused the unfortunate incident. But, happily, we caught it quickly and no harm was caused. Check your robots.txt file to rule out the possibility that someone blocked your website from web crawlers. Yes, it can happen, so make sure you check that out too. Once you have ruled out all of the above reasons why your Analytics might show a drastic drop in organic traffic, then it’s time to start worrying. The general consensus and our experience is that a site-wide Manual Action will typically cause an 80% organic traffic drop. A partial Manual Action can be less damaging, but the drop will not be less than 40%. In this case we were lucky and our client was particularly pleased they had hired us. Because we had experience with Manual Action reconsideration requests and knew how the symptoms could manifest in cases of unnatural inbound links, we were able to go into repair mode right away. Disclaimer: It’s safe to say that when we can’t be sure of the history of a website, it is best to wait for the notification to come in to have all the facts. This following is a case study of a project we had been developing from the get-go and have been working on regularly ever since. Our experience tells us that sticking with one SEO service from the beginning ensures continuity and guarantees the approach is cohesive, making rollback points easy to establish. Again, a good thing about this project is that we had been managing all of this gradually, as the links appeared. So the outreach showed clear signs that we were interested in keeping the project consistently healthy. So, we performed steps 1 – 3, gathered all the proof of our efforts, uploaded them on Google drive, and started writing our reconsideration request. Some of you out there may believe that reconsideration requests are automatically processed and that and that after all your hard efforts to submit them, they are just blindly distributed between YES and NO piles by Google. However, we have solid reason to believe that reconsideration requests are manually reviewed and analyzed and no, not all reconsideration requests are created equal. DO NOT imply that they read the contents of the emails in your gmail account. This is my favorite take away from a case study to date. The other SEO agency’s reconsideration request said, “As you can see from the emails we sent from our gmail account, we tried to contact the webmasters.” They do not read your emails. If you want to get a favorable response, don’t imply that they have. The message from the Google team was promptly delivered. The day we got the notification that the website was no longer under a Manual Action Penalty, organic traffic started rising. This project showed us the importance of a good SEO linking strategy which includes periodical backlinks analysis and also that the long term effects of Manual Actions can bring down a website if not handled properly. In this situation the drastic drop of 90% made the client go from 10,000 organic visits per day to under 1,000. Aside from the fantastic recovery of the organic traffic on this project, we got the project back from 1000 organic visits a day back to just below 10,000 with a quality Google penalty assessment and a good manual penalty recovery method. In short, make sure you have SEO experts on your side when you’re faced with Manual Action Penalties.